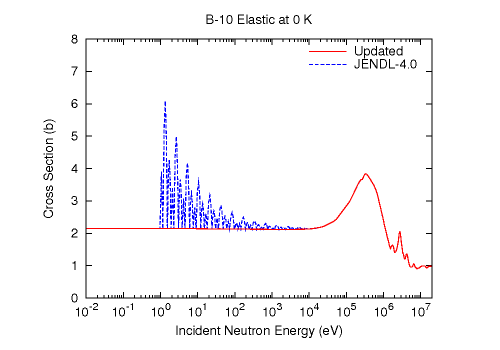 The elastic scattering cross sections of B-10 exhibit strange oscillations in the energy region from 1 eV to 10 keV. This is due to calculation errors by CRECTJ6. In this case, the elastic cross sections were obtained by subtracting the nonelastic cross sections from the total cross sections. The nonelastic cross sections are comparable to the total cross section in the low energy region, since the (n, α) cross section is dominant. S. Chiba immediately revised the data file.